JIM Gavin almost inadvertently raised a chuckle from the other occupants of the GAA media centre on Saturday night when he said “we’ve always got a warm welcome when we’ve gone to Omagh”. The Dublin manager meant it in a genuine way, of course, reflective of the fact that Healy Park has gradually ceased to represent a destination of dread for visiting teams. That might have something to do with the fact that Tyrone have few of the snarling, fire-breathing defenders that populated their team in the glory era of the last decade. And that the seething tension between the counties that spawned the ‘Battle of Omagh’ in 2006 have long since calmed. Still, Dublin have received a hostile reception going away from home on occasion in the recent past. It is only six years since the Dublin players were left clicking their heels by the roadside in Newry several hours after their League game with Down, waiting the Sunday afternoon match traffic to subside after their team bus was not permitted access to Páirc Esler and instead, had to find on-street parking down the narrow road to the side of the ground. Earlier, they were given no access to the pitch to warm-up and then, having been beaten, Dublin arrived back to the dressing-room to discover that there was no hot water in the showers. Yet for all the furore about the advantages enjoyed by Dublin’s unofficial residency in Croke Park, the statistics don’t bear any pattern. In 22 League and Championship matches they have played outside Dublin under Jim Gavin, his team have won 15 and lost just three; one each in Fitzgerald Stadium, Páirc Uí Rinn and Celtic Park. Their last away loss came in February 2015 and in Dublin’s last three visits to Healy Park, they have won two and drawn one of those matches. “In the first few years I played with the Tyrone seniors, Healy Park was always a complete fortress for us,” noted Seán Cavanagh a couple of years back. And not only were Tyrone beaten by Monaghan there in the Ulster SFC in May, they were outnumbered in the stand and on the terraces by visiting supporters. 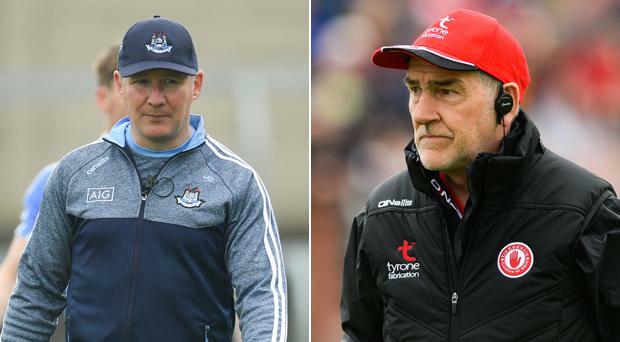 In the same span of time, Mickey Harte’s team have won exactly half of their 26 games in Omagh, losing nine and drawing four, suggesting somewhat ironically that the team finally granted a home tie against Dublin may not actually see it as an advantage.